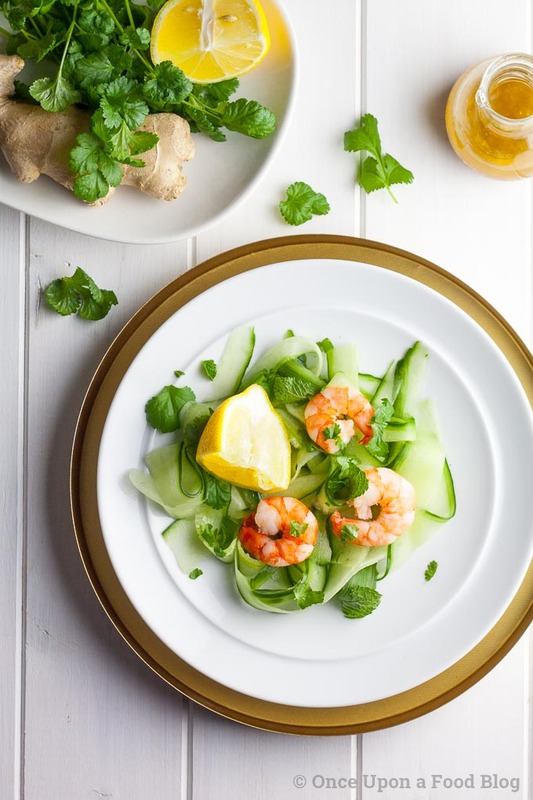 This Asian prawn salad is a fantastic, light starter option for Christmas day. 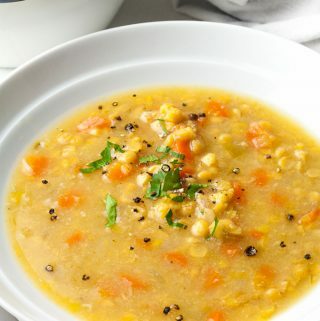 It takes no cooking, is quick and easy to prepare and brings some big flavours to the Christmas dinner table. 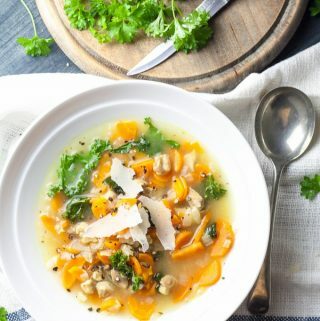 I’ve been asked by a number of people to share some starter ideas for Christmas. For me, my family tradition holds here, and it has to be either smoked salmon or king prawns. As a child I usually had both, it was Christmas day after all. As far as I can remember they were always served with a spoonful of Marie Rose sauce (5 parts salad cream to one part ketchup with a little dash of Worcestershire sauce – anyone who’s had it knows that it tastes better than it sounds! 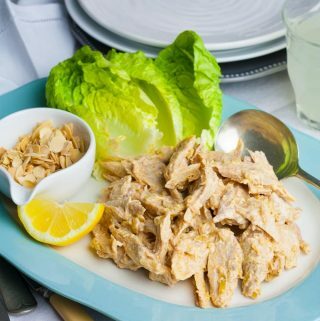 ), a wedge of lemon and the obligatory lettuce leaf – usually iceberg. 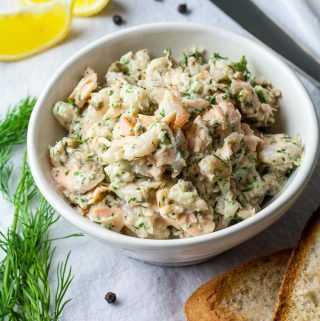 Nowadays the Marie Rose sauce has been replaced with a modern dressing and the iceberg has been banished in favour of fresh herbs but, for me, the prawns and smoked salmon are here to stay. 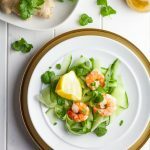 If you are wanting to go for a smoked salmon option, why don’t you have look at my smoked salmon, fennel and watercress salad which I originally posted as a Mother’s day lunch/starter idea. 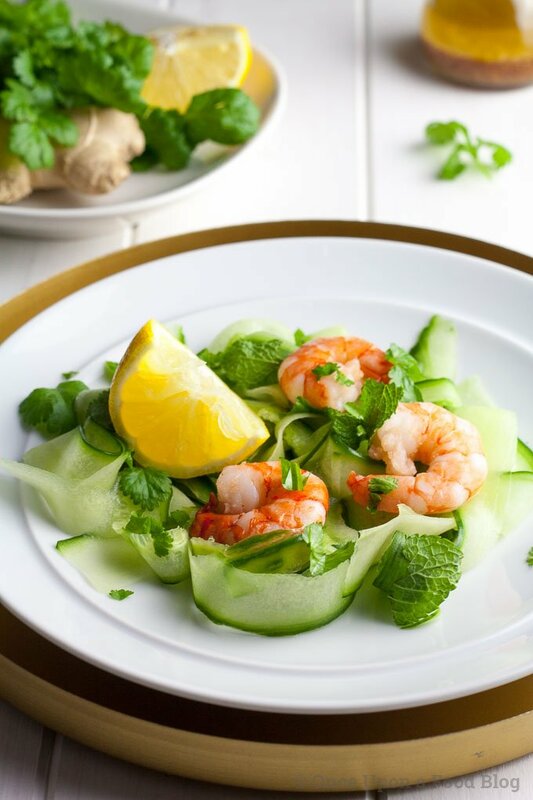 Or for a prawn option, and the starter I’m making this year, you could go for this gorgeous Asian prawn salad. Both are lovely and fresh, require no cooking and very little prep. 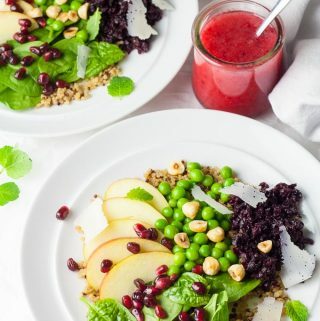 You can even make the dressings of both these salads up to 24 hours in advance. Incidentally, if you want a fish free starter then both my charcuterie board and my baked camembert make great options. 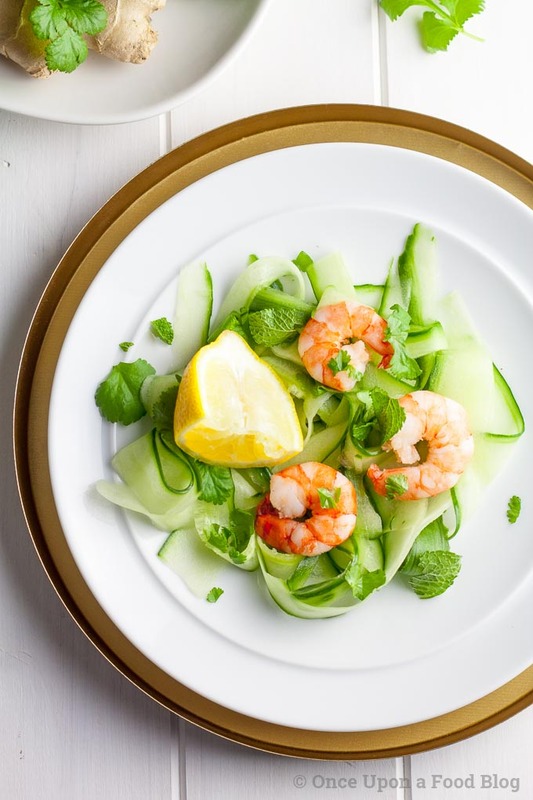 This salad is my take on Jamie Oliver’s Japanese cucumber salad from his Happy Days book but I’ve added the prawns and tweaked the dressing just a little so that it uses more easily accessible ingredients. 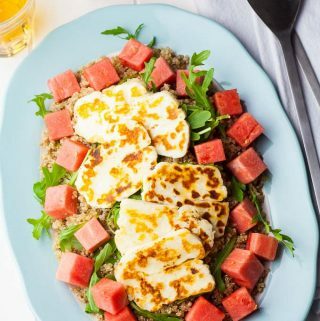 The result is a salad that meets all my nostalgic needs but tastes modern and bright. Top and tail the cucumber, slice in half along its length then turn it on its side. Using a speed peeler, and working from one end to the other in one long motion, peel the cucumber into thin ribbons. Arrange on the plates. Divide the prawns between the plates. 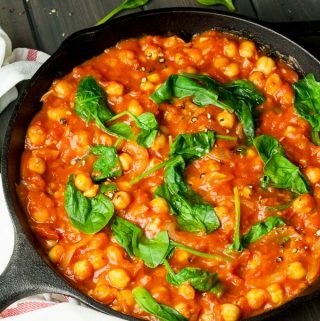 Tear up and scatter over the mint and coriander leaves. Mix all the ingredients together thoroughly. Check the seasoning and adjust if necessary. 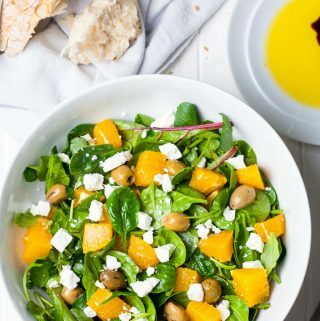 Spoon the dressing over the salad, garnish with the lemon quarter and serve immediately. 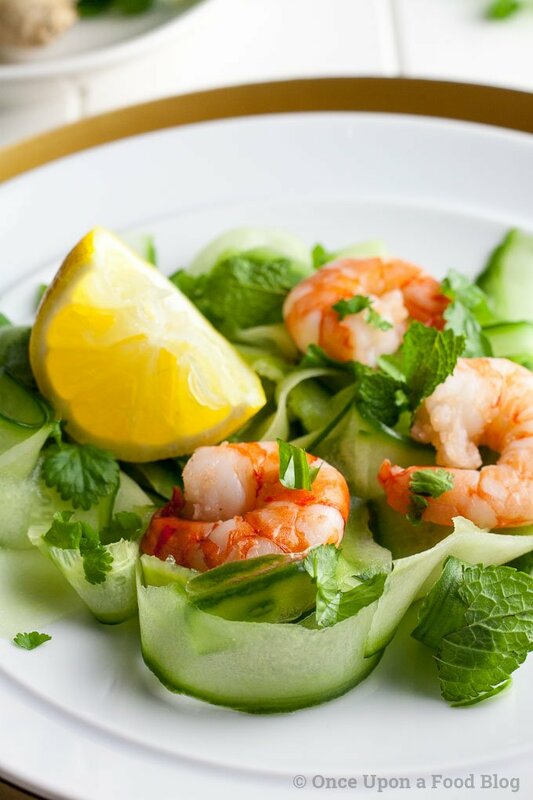 This asian prawn salad looks so delicious! I’ve never used shrimp in a salad before, so I must say I’m really curious to try it. Thanks for sharing!